Thermal Gravity Coffee & Tea Dispenser - 2 gal. This sleek black tea and coffee dispenser uses thermal gravity and features a front sight glass that allows you to see how much coffee or tea remains in the dispenser. The double-wall design keeps liquids hot for hours. A no-drip, pull-down spigot allows quick, easy filling of cups. 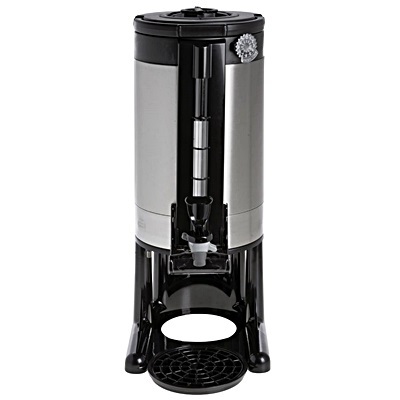 Made of 18/8 stainless steel and plastic, this beverage dispenser features a shatterproof vacuum stainless steel liner for excellent heat retention.